In the gallery, September 14th – 16th. 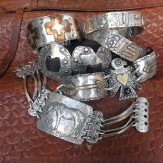 Last year, this creative silversmith won the award for best jewelry at the Western Design Conference. We can’t wait to see what she brings to the table this year. View an expanded selection of Margaret’s work, and meet her from 10am – 6pm in the gallery, September 14th – 16th. To see our current selection of Margaret’s work, click here.